President Mary McAleese has led tributes to Dr Garret FitzGerald, describing him as a Renaissance man of our times. Read an RTÉ Guide interview with Dr FitzGerald in April 2010. In a statement, President McAleese said that, like many others, she was deeply saddened to learn of Dr FitzGerald's death. President McAleese described him as a man steeped in the history of the State who constantly strove to make Ireland a better place for all its people. 'His thoughtful writing, distinctive voice and probing intellect all combined to make him one of our national treasures. Above all, Garret Fitzgerald was a true public servant,' she said. 'Long after he departed active politics, Garret continued to contribute to public life through his voluminous writing and scholarship. Taoiseach Enda Kenny hailed Dr FitzGerald as 'a truly remarkable man who made a truly remarkable contribution to Ireland. 'I would say his towering intellect, his enthusiasm for life and optimism will be missed by everyone,' Mr Kenny said. He said Dr FitzGerald was the epitome of high honour and decency in public life. The Taoiseach said that Dr FitzGerald would have been pleased at last night's contribution by Queen Elizabeth II and the effect of the State visit. He said Garret FitzGerald had made a remarkable contribution to Irish life. Britain's Queen Elizabeth II has offered her sympathies following the death of Dr FitzGerald. The Queen sent a personal message to President McAleese praising Dr FitzGerald's dedication to peace in Ireland. 'I was saddened to hear this morning's news of the death of the Garret FitzGerald, a true statesman. He made a lasting contribution to peace and will be greatly missed,' she said. 'On behalf of the people I would like to extend my sympathy to John, Mark, Mary and the extended family. He will be missed by Ireland and his beloved followers in the Fine Gael party'. European Commission President José Manuel Barroso has written to the Taoiseach to convey his sympathies. Mr Barroso described Dr FitzGerald as 'a great leader of the Irish people and a committed and outstanding European'. 'We will remember him for the central role he played both in Ireland and in Irish-European relations, but also for his convictions, his brilliance, his energy and his friendliness,' he said. Former Taoiseach Bertie Ahern said he was always approachable and friendly in those days and that never changed. 'Garret was never partisan or tribal. He truly did put people before politics.' he said. Mr Ahern's successor, Brian Cowen, said Dr FitzGerald was 'always gracious, friendly and courteous'. 'What I always admired about him most was that though he was a distinguished man of letters, he was also real man of action. He participated actively and vigorously in our democratic life,' Mr Cowen said. Fianna Fáil leader Micheál Martin said he made an enormous contribution to Irish politics and to our wider society. 'He has served the Irish people with great intelligence, decency and commitment in a lifetime devoted to public service. Former President Mary Robinson paid tribute to Dr FitzGerald's great integrity. 'A deeply spiritual man, he lived his values and gave of his time and boundless energies in high political office. Later, he continued as a guide and mentor to this country he loved so much through his writing, broadcasting and public speaking here and around the world,' she said. 'Garret had a great capacity for love and friendship, of his wife Joan and his large immediate family but also of a wide circle of friends, including children who delighted in his company. Scottish First Minister Alex Salmond said Dr FitzGerald will be 'fondly remembered as a national leader of vision and integrity'. Archbishop Diarmuid Martin has described Garret FitzGerald as a Christian in politics even though he challenged Catholic orthodoxy. He said Dr Fitzgerald's Christian values and understanding of his own Christian identity influenced many of the things he did. The Archbishop said Dr Fitzgerald was a creative thinker, who was ahead of people and looked at things in a multi-dimensional way. Gemma Hussey, who served as Minister for Education in Dr FitzGerald's cabinet, said people on both sides of the border recognised his utter integrity and sincerity. The former Stormont Deputy First Minister Seamus Mallon said Dr FitzGerald had the foresight and courage to force the British government by weight of arguement to address Anglo-Irish issues they had been previously ignoring. 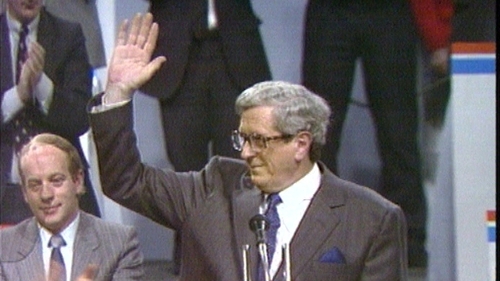 Another former SDLP leader, John Hume, said: 'A moderniser and reformer, Garret helped change the face of Irish politics for the better and he enthusiastically embraced Europe and the opportunities it afforded our island. SDLP Leader Margaret Ritchie said it would take time and historical perspective to fully appreciate the achievements of Garret FitzGerald in Irish public life, but his contribution to the peace process must surely stand out. Minister for Education and Skills Ruairi Quinn said 'he was a man of great integrity and powerful intellect'. MEP Gay Mitchell described Dr FitzGerald as one of the remarkable 'Irish Europeans' in living memory. Mr Mitchell said the former Taoiseach was dedicated to peace on the island of Ireland and said he did not believe any other Taoiseach could have persuaded Margaret Thatcher to take such a historic step as the 1985 Anglo-Irish Agreement. He said Ireland, Europe and Fine Gael have lost a towering intellect and statesman. IBEC Director General Danny McCoy said Dr FitzGerald will be remembered as a committed European and a key figure in shaping the modern Irish economy and its relationship with Europe. The Board of RTÉ has also expressed its sadness at the news of the death of Dr Garret FitzGerald and extended its sympathies to the FitzGerald family. Dr FitzGerald was a member of the 13th RTÉ Authority (retitled the RTÉ Board from 2009) and served through its term of office from 1 June 1995 to 31 May 2000. RTÉ Chairman Tom Savage said that the Board had heard today's news with sadness: 'Dr FitzGerald was a full, enthusiastic and generous contributor to the formal business of RTÉ as he was to all of the countless civic, political and academic duties which he performed in his long career of service in Irish public life. RTÉ Director General Noel Curran added that Dr FitzGerald had been a consistent contributor to RTÉ news, current affairs and documentary programmes on Television and Radio over many decades.